Charlie Chaplin saw stereoscopic pictures of the Donner Party and the Klondike while visiting Douglas Fairbanks and Mary Pickford. He was intrigued by pioneers eating their moccasins. The two ideas coalesced into a story idea and Chaplin wrote the "Gold Rush," a story about the "little tramp's" search for gold, wrapped in humor and pathos. 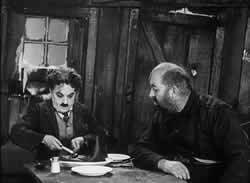 It was kind of strange to take the tragedy of the Donner Party, the cannibalism and starvation, and turn it into a comedy but Charlie Chaplin was successful. The "Gold Rush" was, according to some, his most successful movie. It was the highest grossing comedy of its time. It was also the most elaborate and expensive of any comedy of the silent era. Donner Summit served as the setting for the "Gold Rush" which became the first movie to be filmed there. Watching the movie you will see gold seekers climbing the "Palisades" at what is now Sugar Bowl. Unfortunately, many of the cast caught colds and flu while filming on Donner Summit so filming moved to Hollywood where the sets, covered with salt and flour, became a tourist attraction. To read more about that kind of thing: Charlie Chaplin - The Rest of the Story. Among the many people coming to find gold was the "little tramp." He avoids a bear on arrival to Alaska (Donner Summit), weathers a storm, and comes to an isolated house. Someone has to go for food and Black Larson "wins" the draw. Big Jim and Charlie are left in the cabin, starving. They cook a boot, hallucinate, and shoot a bear. Big Jim and Charlie separate. Black Larson steals Big Jim's gold and goes over a cliff. Charlie falls in love with Georgia, a beautiful dance hall girl who ignores him. Charlie puts her picture under the pillow of the house he's house sitting. It's found by some girls. A foot catches fire. Charlie invites the girls to New Years and prepares. He's stood up. There's a dance of dinner rolls. 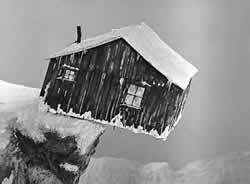 A house teeters on a cliff edge. Gold is found. Charlie and Jim ship out where Charlie is mistaken for a stowaway by Georgia who happens to be on board. Charlie sees Georgia. The ending is happy. 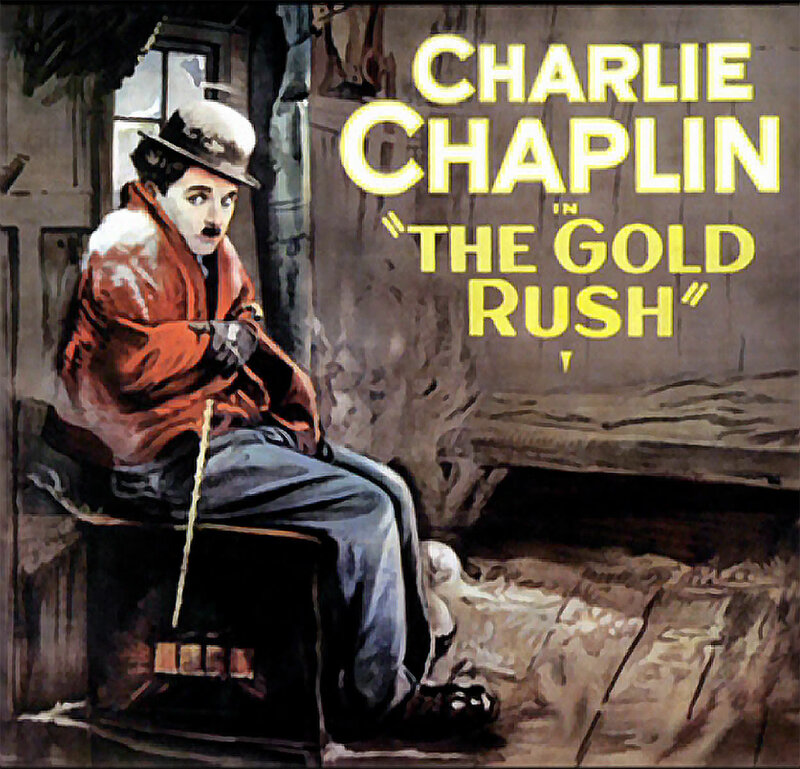 Charlie Chaplin said the "Gold Rush" was the movie he most wanted to be remembered for. The "Gold Rush" was not the only movie filmed on the Summit. Goofy's "The Art of Skiing" (1941) was filmed entirely on the Summit featuring Sugar Bowl. It is a tour de force for skiing style. "Two Faced Woman" (1939) took place on Donner Summit and has some familiar views for those who know the Summit. See also the article "Donnerwood" about movies made on Donner Summit in the 3/'09 Heirloom and see our index of articles for the heading, "Videos of of including Donner Summit." The highest grossing comedy of its time. It was the movie Charlie Chaplin most wanted to be remembered for.